It’s impossible to be perfectly prepared for an imperfect world. Sometimes you just have to go MacGyver and solve common problems by using the resources you have on hand – combined with a little ingenuity, of course. I’ve always said that the ability to improvise is one of the most important survival skills. 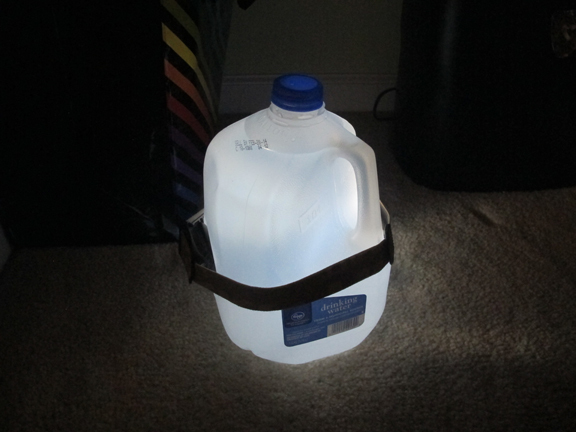 This article is a collection (not all my own I’ll admit) of a few, creative, makeshift lighting solutions you may have to deploy as a last resort if the grid goes down. You just never know when one of these innovative ideas might shed some light into your darkness one day. 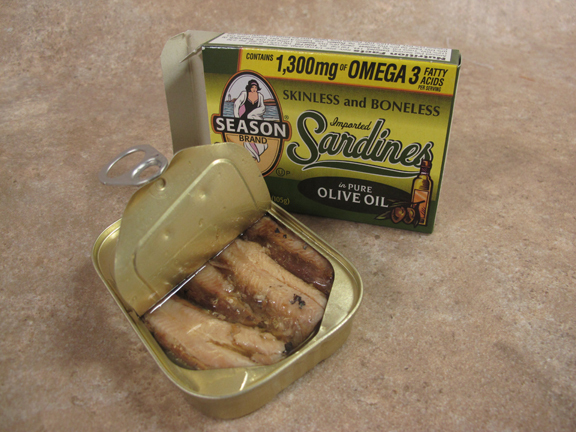 Sardines are an excellent survival food. They have a long shelf-life and are full of protein and fats. Maybe you have some sardines packed in your emergency food storage. If not, consider them. On a different note, oil lamps have been used for hundreds of years. From rendered whale blubber to modern kerosene lanterns, oil lamps are excellent “off-grid” lighting solutions. What do sardines and oil lamps have to do with each other? Quite a lot, actually, if your sardines are packed in olive oil. 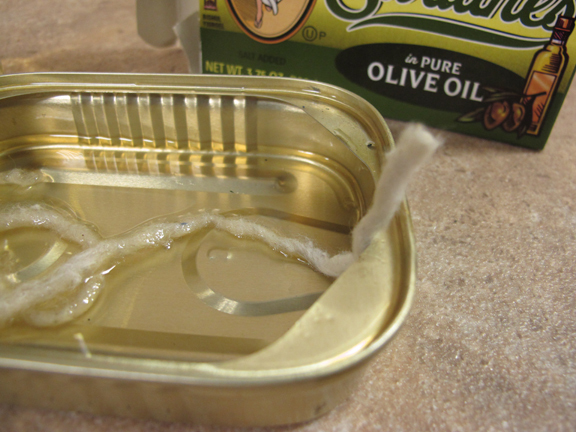 Once you’re done smashing those tasty bites of fish, place a natural fiber wick into the remaining oil and slightly over the edge of the sardine container. 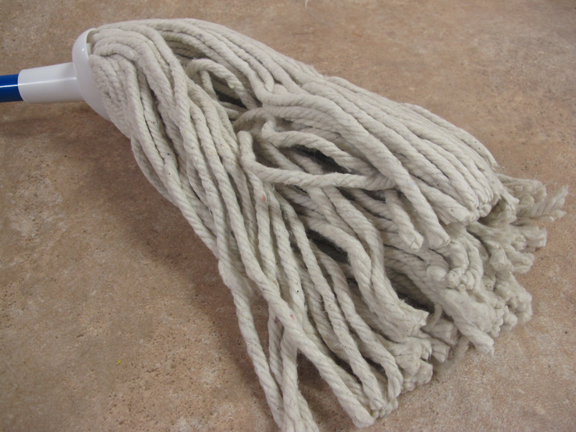 The wick, in this case a cotton string from a mop head, will absorb the oil. Once the wick is fully soaked, simply light the end. 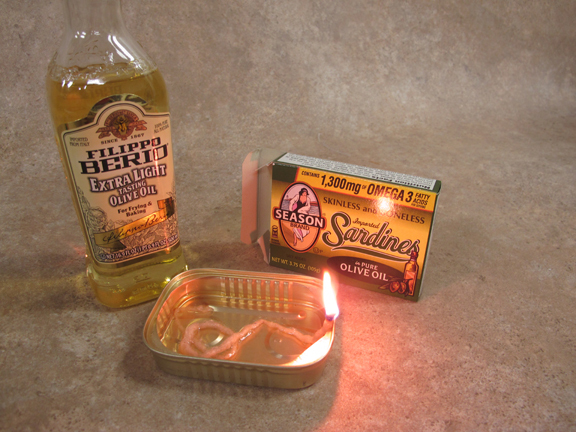 A sardine lamp with just a little bit of oil will burn for many hours. Sure, it’ll smell like fish, but that’s what you get for not including emergency candles in your “bug in” supplies. Running low on oil? No problem, just top it off with some more olive oil from the pantry – or any cooking oil for that matter. Games and toys are excellent items to pack in an emergency kit – especially if you have small children. 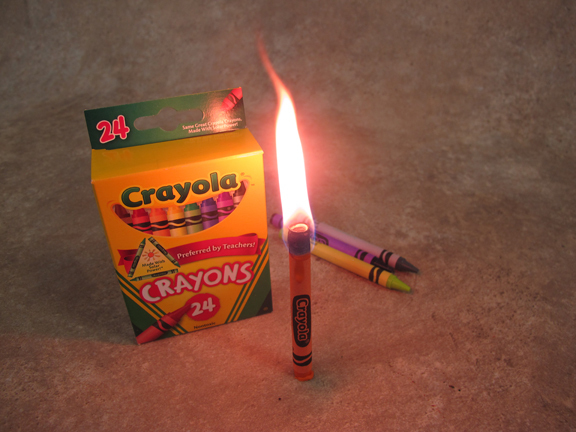 Simple toys such as crayons and coloring books can help keep their mind off of the misfortune that caused the lights to go out in the first place. 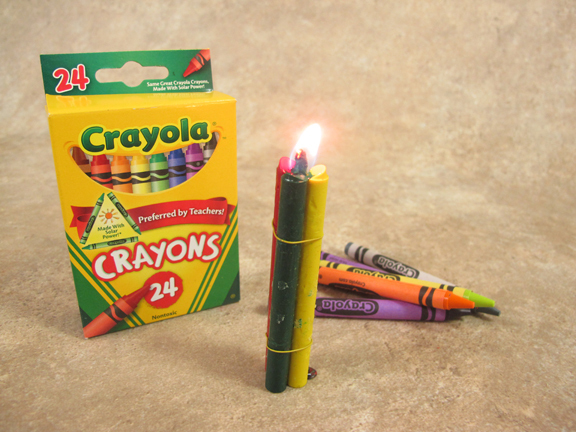 But if you’ve focused only on toys and no essentials, like candles and flashlights, then you may have to sacrifice some of their least favorite crayon colors and make some Crayndles. I made that word up. Crayons are basically colored wax. 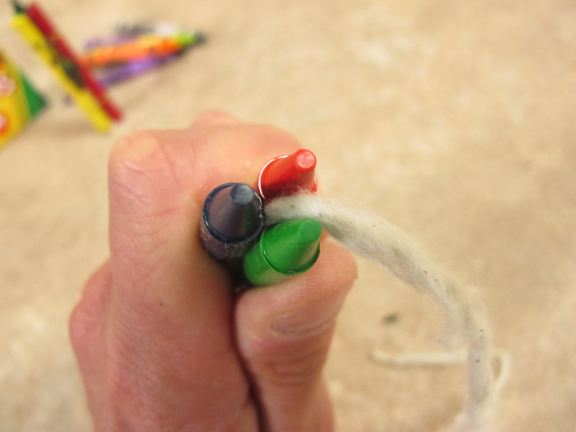 If you’re in a hurry, just break the point off and light the paper label at the end of the crayon. As the wax melts, the paper becomes a wick and one crayndle will last about 30 minutes. Not too bad. 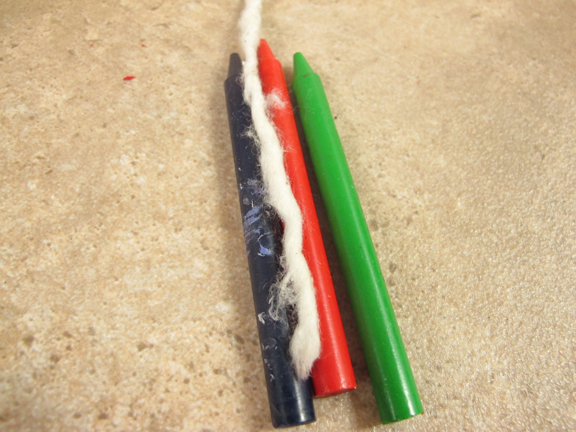 You can also get a little more creative and sandwich a natural fiber wick (like a shred of t-shirt material) between three crayons that have been stripped of their labels. Bind everything together with two short pieces of wire. Paper clips work well. Then, simply light the wick. I got one of these to burn about an hour. Not too bad for a 10-second makeshift crayndle. If you’ve listened to anything I said in “Build the Perfect Bug Out Bag,” then I know you at least have a headlamp packed in your 72-hour disaster kit. Yet as nice as headlamps are, they aren’t always the perfect lighting solution. Ever tried having dinner or playing cards across the table with someone who’s wearing a headlamp flashlight? It’s really annoying and gets really old, really fast. You get blinded every time they look at you. If you’re like my mom, then you have a jar in the cupboard where you pour and keep excess bacon grease. This grease makes the perfect improvised survival candle. 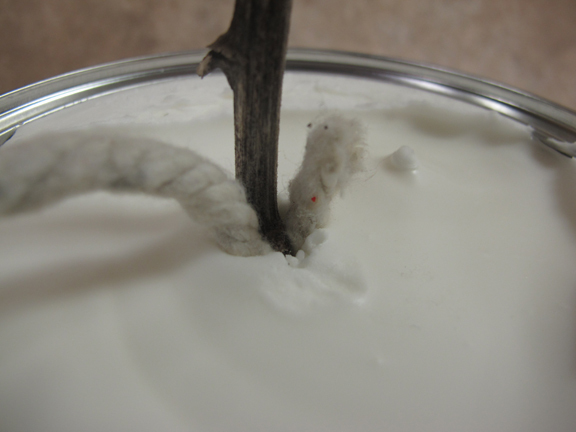 Jam in a natural fiber wick and light. It’ll burn as long as any comparable sized candle. 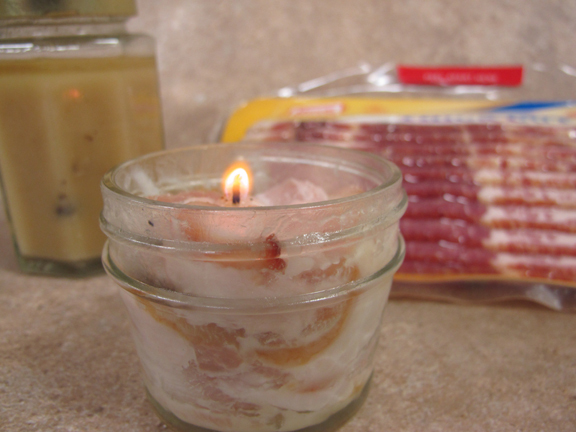 See this post here about how to make a BACON GREASE CANDLE. No bacon grease? No problem. If the electricity is out, then the bacon in the fridge is going to go bad anyway, so you might as well use it for something. 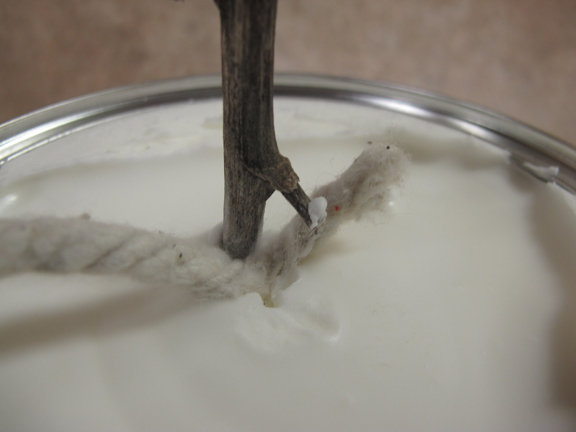 Tear off the fatty pieces and jam them in a jar around a natural fiber wick, and this will burn like a candle as well. The fatty bacon pieces will melt just like wax. Mmmmm, smells like bacon. TIP: Smear the wick with bacon fat first! But what if the electricity is off for more than 30 days straight and you need a light source that will shine for at least a month? 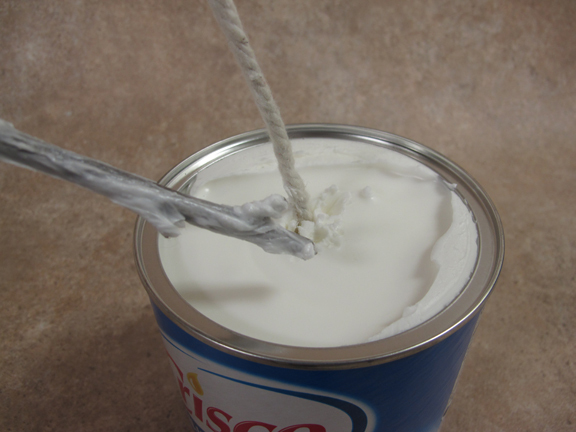 No problem, Crisco’s got your back. 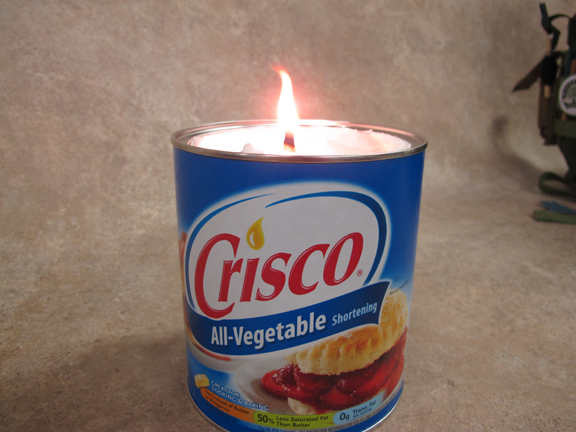 Press a natural fiber wick (like a cotton t-shirt shred or a mop strand) using a forked stick to the bottom of a can of Crisco and you’ve got one of the longest burning emergency candles on the planet. Yum, doesn’t that make you hungry? Fried chicken anyone? We’re testing it right now but I’ve heard reports of these burning for more than 30 days straight!!!??? 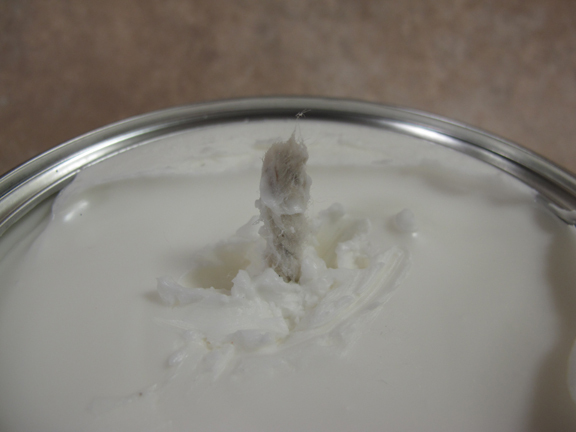 Note: Smear the top of the wick with Crisco to get it to burn better. What’s the lesson here? Make sure you have non-electric lighting solutions in place just in case the grid goes down. If your solutions are battery powered, you will also need extra batteries as well. 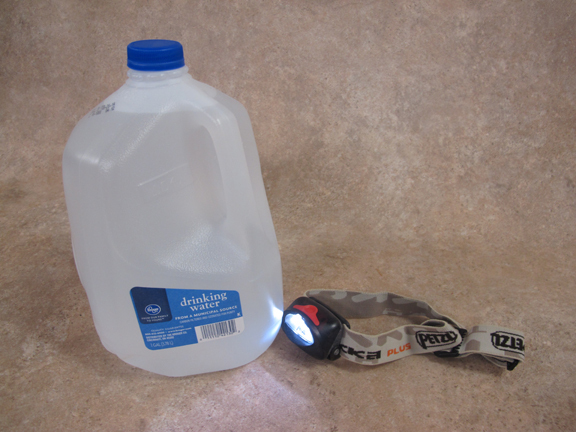 Oil lamps, flashlights, candles and glow sticks are great emergency light sources. Don’t resort to smashing bacon fat into a jar with your bare hands unless you absolutely have to. Note: Candles have a bad reputation of causing house fires. Makeshift improvised candles are even more dangerous. Use only as a last resort, burn only on a noncombustible surface and keep close watch on any makeshift candle. A house fire can turn a “bug in” scenario into a “bug out” scenario really fast. Reprinted with permission from Willow Haven Outdoor.